I thought that day will never arrive... I've decided to start on the 71! I got this 429CJ matching numbers back in 2000. till mid 90's it ran in Paris and then in south west of France very very strong (very very thirsty too). The PO, a good friend of mine, placed a new Lunatti cam in it, and within few weeks, engine died and never started again. My friend, in middle of divorce and other stuffs, had no time and brought it to a local 'specialist'. This brave man took his time, removed/opened the engine, the trans and the dashboard for unknown reasons, and with parts all over the place he decided it was time for him to retire and shut down his shop business. Not touching the car further or put it back together. The car stayed in this garage for 2 years under this guy heavy tortures. My friend tired of all the extra stress in his life at the time, called me and said. 18 hours later, I arrived at the garage with a trailer. Went to this garage, all tools, parts where all over like if someone was in a lunch break. I've collected all the parts I could find laying around, each and every bolt, washers, brackets... Then went to another shop where the engine was for check. They found out a lobe on the new cam went round. So after collecting all engine parts over there, put all in the car and went back home. 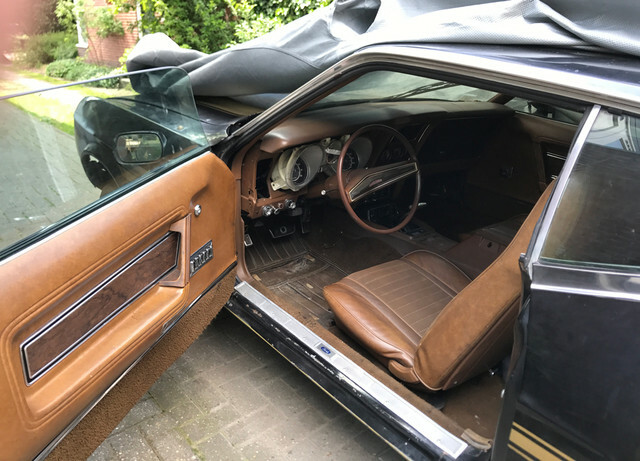 As the 73 was under surgery in my garage at the time, it went into a friend's barn till I would come to it. The engine block however went straight to a machine shop I know, where lower engine was checked/put back together. new pistons/rings etc.. and stayed in my garage since then. This is what 20 years of dutch dust looks like. First goal: put the engine together, so I can free some space in the garage. While busy looking at what I can (re)use, and what I need, I started with the first candidate: the intake. 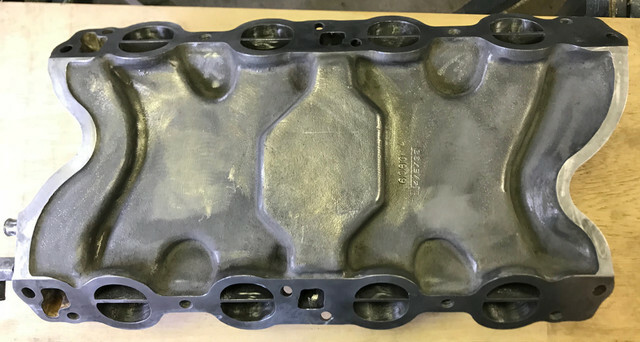 The heads kept in oil will go to the machining shop for a well deserved bath and valves/surface job. 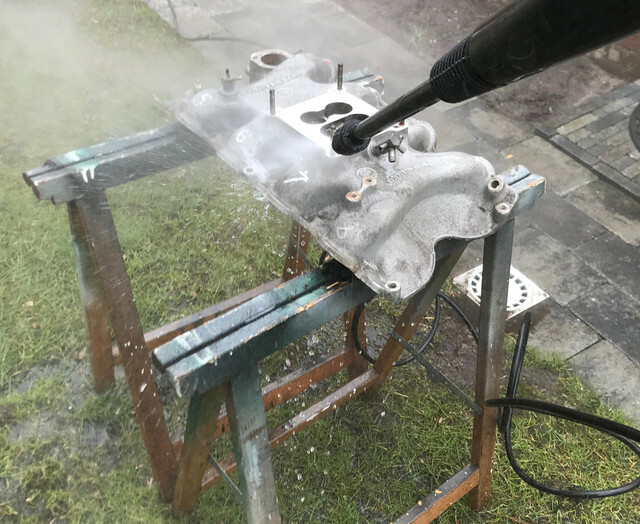 I have the original one but being as heavy as my wife's mini, I will not use it and use the hoffy my friend placed on the engine. As it gave a noticeable boost to the engine back then above the original, all it needs is to be refreshed a bit. Here the lower engine in its time capsule and the dirty intake. After one hour labor and no real changes, I decided use big gun. After a high pressure massage, the aluminium started look more aluminium. I still need improve here and there but it starts looking like an intake! (04-02-2018, 05:36 AM)luxstang Wrote: Wow, what an Odyssey! While adding picts of the progress, I'll post some old and current picts and add some anecdotes of this car. While it doesn't look pretty atm, car is almost complete. 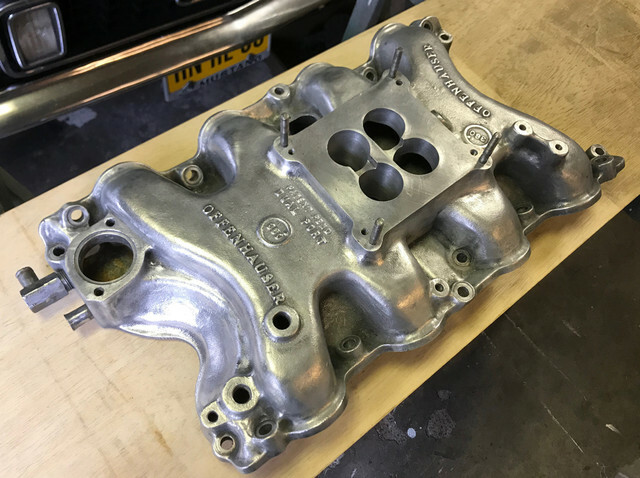 At least most the 429 CJ hard to find parts I want and need are there. Engine wise, I might need buy a few specific bolts here and there. I'm not planning to do something wild with it. With this already revised engine with new pistons/rings + few good parts it should be more than enough. The interior misses one power window bezel and the middle console ashtray and all it will need is tons of love (make that megatons). I don't have yet the total picture of where I want it to be, my head is more to the 73 which I'd love to have back on the road this year. I'd start draw stuffs as I go. For now, It's all gonna be about saving what can be saved as I've seen in past few days weeks looking online that parts for 429 and CJ's in particular, have sky rocketed since the 80's. Back then it was already more expensive than for a 351C, but now.. man, I know its gonna be a restoration and will have to reduce the shopping list as much as possible. So in that regard, I took 3 of candidates on the todo today. First the valves covers. Pitted, dirty, they'll have to get back on duty till I can find the original aluminium ones without loosing an arm. The funny thing here, I was there when these replaced the original ones. They were cracked and thought beyond repair at the time. With bits of love they came back to a presentable state. and then came one of the parts nobody cares about, till you see how much these cost when you find them. For now, cleaned/polished it by hand vs aggressive brush to keep as much as the original metal treatment. After reading a few threads on fans, I've carefully inspected mine. No cracks, no rivets having bad looks. I could let some company coat it.. nah, how hard could it be??? 2 or 3 hours? 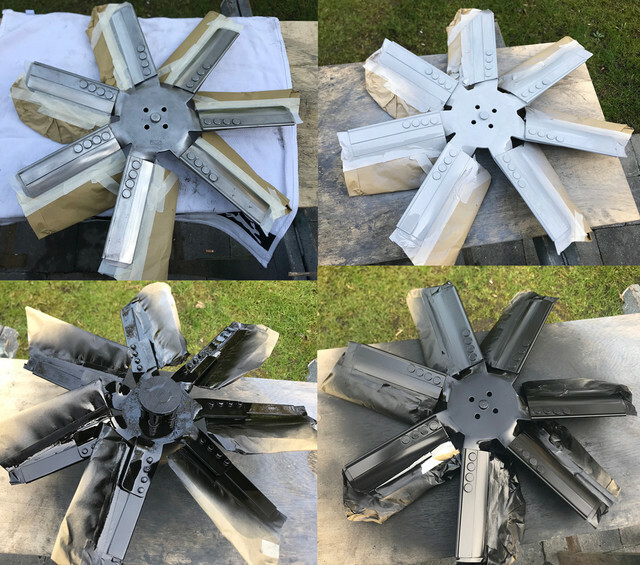 The 429 seven blades fan in its juice (what turns out to be 4 different layers of paint that didn't want to react much with solvents). most needs be done by hand. Acetone, thinner were doing almost nothing. All had to be sanded by hand. On the right, blades and their 4 layers of paint removed. Time for some polish work... 14 blades surfaces. I've lost count of hours at this point. and then: tadaaaa! After hours and hours and hours. You got to rediscover the baby after its transformation. I'll add a thin clear coat layer to it prolly next week. 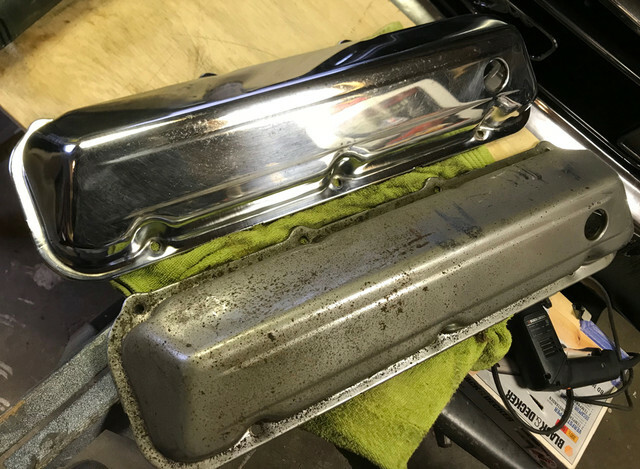 Next week If I haven't received the door hinges kit for the 73: the oil pan is next. Some welding on the program..
Fabrice, this is really going to be a great build to watch. Considering how many Mustangs have been built over the years, there weren't very many of these one year cars to start with. For you to have have one in your possession in the Netherlands is nothing short of amazing. I followed Pastel Blue's 429 Vert project from the start, unfortunately he left us just before it was finished. 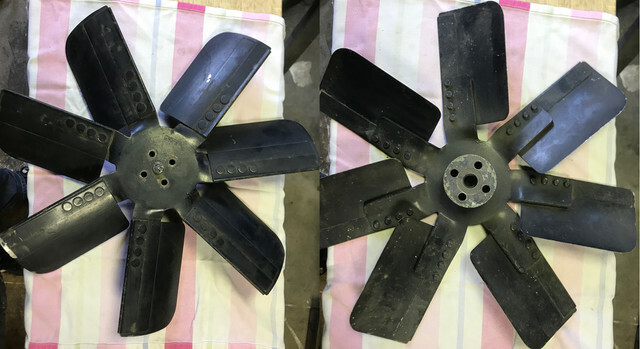 Glad that you reread the fan posts so you would be aware of how to inspect and carefully handle the flex blades. The 19" 429 blades were not part of the recall but still doesn't hurt to inspect them as part of your normal maintenance. If original, your blades should have "DOOE-A" stamped on it for the ID number. Agree the OE aluminum valve covers are now priced as if made of gold. Back when I was running a 429 in my Gran Torino I threw away several sets of them that were given to me because they were all cracked from over tightening. The sad part is all the ones I threw away then would be repaired now. 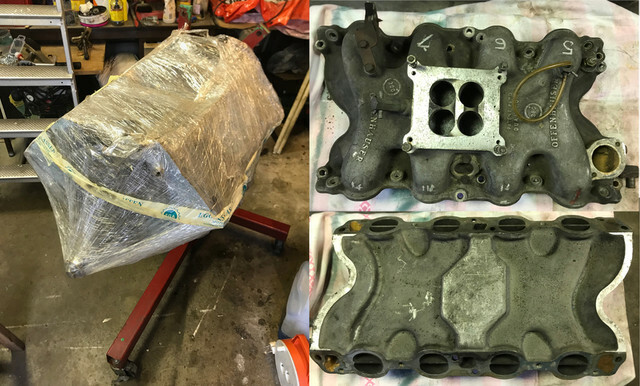 I Finally found a good set on a retired 72 Police Interceptor that I was also pulling the heads and intake to use on my Hot Rod! Please keep us posted and especially if you need any help finding any 429 "Stuff"
(04-08-2018, 03:48 PM)secluff Wrote: Fabrice, this is really going to be a great build to watch. Considering how many Mustangs have been built over the years, there weren't very many of these one year cars to start with. For you to have have one in your possession in the Netherlands is nothing short of amazing. I followed Pastel Blue's 429 Vert project from the start, unfortunately he left us just before it was finished. For you to have have one in your possession in the Netherlands is nothing short of amazing. Over the years, I saw very few true CJ's on this side of the pool. I know a german guy and his son in law having 2. 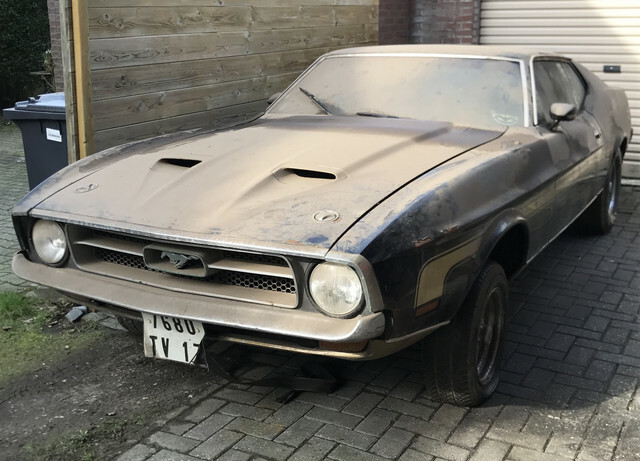 He came 1 or 2 times at one of the dutch mustang club meetings (badly tuned, he was running bit more than a liter per km, if you know the fuel price here, you know why he did not visite more often). I knew a guy in France, who had several 429's. This one was one of his. Sold to 2 friends buying cars to have fun and resale to finance their next project. They sold it to my friend in 89 or 90. While I will not restore it with originality in mind, I will restore/light mod it with love I enjoy the hobby and will do most myself. The mods will be light and I will keep all parts I have and do not use so it could be reversed and parts sold with the car, if I was forced & tortured to do so. I don't care about its value. I care about it. Thats all. Just went back to the garage and checked: looks like it's indeed the john Dooe. What does the S stands for? Thank you, I will! As said above, for now its about saving/restoring parts, I don't think I miss much but with the engine components, electrics and many other parts laying apart in boxes around. I'm probably wrong about that tho Time will tell. 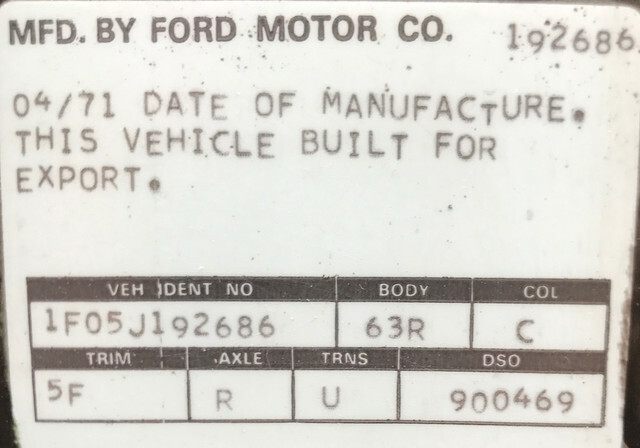 Fabrice, other than the Ford ID number and date code, all other marks would be the manufacturer ID and other in plant use info. The "S" in front of the "DOOE-A" is not part of the Ford number and is most likely the the manufacturer mark. I've seen "CF" on most fans. Since the 914 is a different font from the rest of the numbers it is also probably in plant use numbers. The rest of the numbers appear to be the date code. 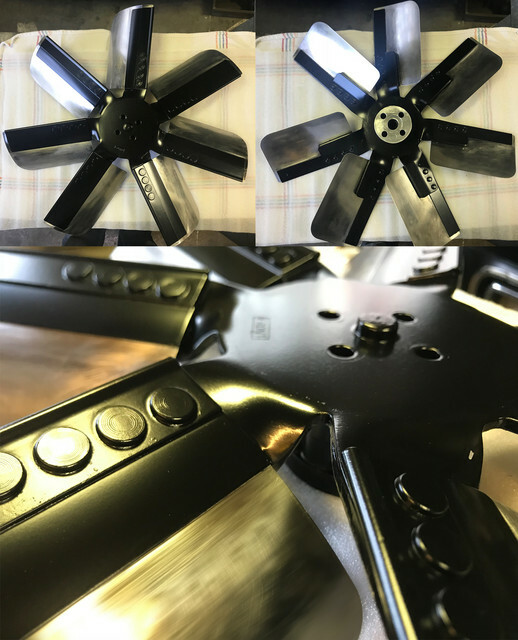 Geoff (Stanglover) could probably offer more insight on these additional numbers since I believe he worked at the company that manufactured these fans for Ford. (04-09-2018, 09:22 AM)secluff Wrote: Fabrice, other than the Ford ID number and date code, all other marks would be the manufacturer ID and other in plant use info. 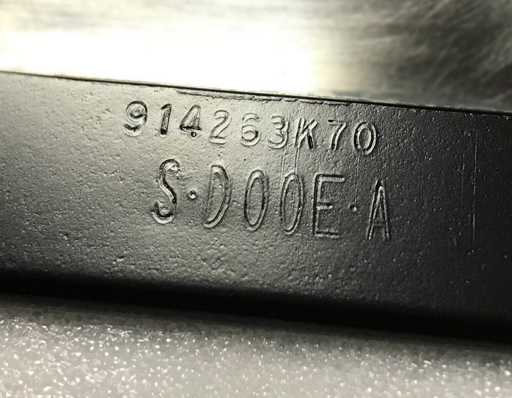 The "S" in front of the "DOOE-A" is not part of the Ford number and is most likely the the manufacturer mark. I've seen "CF" on most fans. Since the 914 is a different font from the rest of the numbers it is also probably in plant use numbers. The rest of the numbers appear to be the date code. 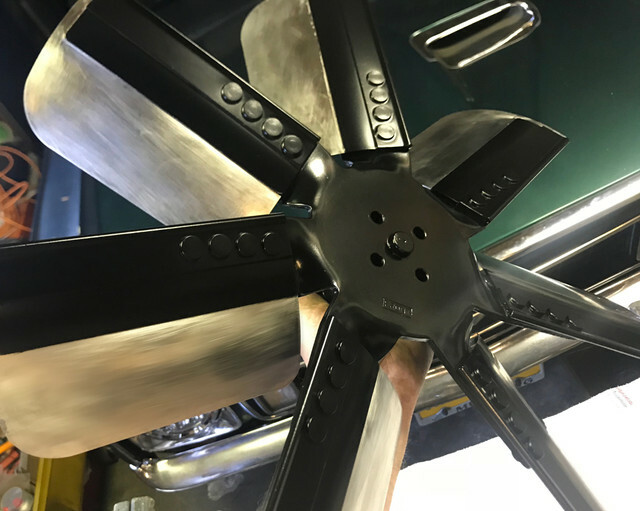 Geoff (Stanglover) could probably offer more insight on these additional numbers since I believe he worked at the company that manufactured these fans for Ford. Reminds me I should have posted a pict of the vin earlier. I think it should be dark green but no idea about the stripes/decals if any and what colour they should have. Hey Fabrice...NICE work so far!